This is a little bit late in coming, but Singapore had it’s biggest party recently. It’s called ZoukOut, an all-night beach party on Sentosa island where DJs spun on four stages while party-goers alternatively danced like mad and half-passed out on the sand. It was exhausting, but fun. Some of the acts were very impressive. And the most amazing thing? Even at 5am, you could walk barefoot on the sand without stepping on anything that could cut you. Even at its wildest, Singapore is still pretty tame. Actually, this entry is all just an excuse to demonstrate that I’ve joined the YouTube world. My next video posts will be much more interesting — promise. I’ve been thinking a lot about presentations lately. Singaporean students have to give a lot of presentations. They give several in my classes, and many for their other classes as well. There’s a lot of enthusiasm here for creativity — the prime minister managed to step outside of regular speech-giving in his National Day address in August. (See bloggers’ comments on interesting metaphors, interesting colors, and the all-around “hipper” political leadership.) But my favorite creative endeavor in Singapore (other than my students’ ideas) thus far comes from the Media Development Authority’s annual report. I don’t think I’ve ever seen such a display of, well, hippness. Get connected worldwide rock on. I took a trip to Kuala Lumpur this weekend. It was a long, eventful two-day sojourn. I left with some friends on Friday night on an overnight train — that’s my storybook beginning. It’s almost Harry Potter-esque, isn’t it? Sleeper trains are a great way to travel. When we got to the city, we went to a hostel in Chinatown, which I found to be a pretty convenient location for seeing the sights. The Backpacker Travelers’ Inn was also like a storybook. It’s one of those place you can tell has been around for a long time. There were posters from the 80s on the walls, and a shelf where backpackers can buy and sell used guidebooks. The receptionist seemed to have too many people — too many storybook characters, maybe — floating around in his head. He had a lot of stories to tell — not that his guests should necessarily believe them all. That day we took a trip to the Batu Caves, about 20 or 30 minutes north of the city. Inside the caves are simple South Indian-style temples. The main temple is devoted to Murugan, a god of war who comes to the aid of those in need. It’s hard to imagine a place that is better for prayer. The caves look up to the sky — and forgive me for being a bit cheesy here — and you almost feel like you’re getting a glimpse of heaven. Then there was shopping — I discovered, as my backpack got heavier, that it is not a good idea for me to be around so many reasonably-priced textiles and shawls. The next day, Kuala Lumpur and the area around the Batu Caves were consumed by protest. I wrote a quick post for Global Voices, but I’ll just add here that I was on the fringes of the protest. There was some really courageous journalism and blogging happening around this story — some reporters got right into the tear gas. Some got close enough and were patient enough to get amazing shots. I woke up in the morning planning to go to a large shopping mall near the Petronas Towers. I went to the train station — the two stations near the centre were closed and there were police officers observing travelers at both entrances to the station. I tried to hail a taxi — it took me four tries to find someone to take me near the shopping centre. They all explained that the traffic was too bad and roads were closed. I could see groups of bewildered South Asians walking around Chinatown trying to find a way to get to the protest. Many of them, I found out later, went on foot, walking as much as 5 or 6 km in pretty serious humidity. I discovered that I can pass in many situations — I can be Indian, some thought I was Malay, some just saw me as an American. I think this helped me get a taxi to drop me about half a mile from the protest. I got to the protests and watched for about an hour and a half. There was a lot of tear gas — I could smell it even though I was about half a city block from where it was being used. The protesters had come from all around Kuala Lumpur and were very persistent to get there. They clearly felt strongly for their cause. When it was time to leave, I walked for about 45 minutes before I could get far enough away from the protest to be able to get a taxi. I was lucky to get one — I didn’t see any other taxi stop to pick up anyone up who looked like they were coming from the protests. I got back to Chinatown, had a good lunch and a good look at some more textiles (luckily I was too exhausted by that time to indulge any more). We waited for the charter bus back to Singapore for about an hour and I was asleep as soon as I found a comfortable spot in my recliner. I’m just catching up with the news about the wildfires in Southern California. A friend told me that the Los Angeles Times is really covering the story well — and it’s true. I really like the “Voices from the Field” stories — I was happy to see the coverage not focused on the Malibu elite, including a nice feature about a firefighter’s wife. The Governator is getting some good press out of this whole thing, as well. It’s funny, the synergies you get between places really far away. On Monday, I was in the library working as close to the newspaper stands as I could get while still allowed to drink coffee. (Lucky for me, there’s a cafe near the newspaper and magazine racks.) That morning I chose the Financial Times. Politicians used to meet in smoke-filled back rooms. Arnold Schwarzenegger, action movie star turned governor of California, prefers open-air tents. As a cigar connoisseur, he had to come up with a novel way around California’s ban on smoking in public places when he was first elected four years ago. He had a tent built outside the capitol building in Sacramento where he can ponder policy while smoking his cherished Macanudo cigars or offer advice to fellow conservatives eager to win elections. But look closely at the image. The cigar has a black strip across it. I know Singaporeans are tough on smoking. There are very few public places that you can actually smoke here. (Careful with the links if you’re squeamish.) On my first trip to 7-Eleven, I learned that vendors are required to place some pretty brutal images of potential health risks on cigarette cartons, a practice that several other countries have also adopted. In March, the government launched a shocking “Quit Smoking” campaign which drew some angst. American anti-smoking campaigns seem pretty tame in comparison. So I wondered, is this why the pink paper has censored the Getty image it was running? Is there some rule about publishing images of smoking here? There’s not a lot of documentation on the Internet about newspapers blacking out images of cigars or cigarettes. I found one blogger’s account of the act of smoking being black-dotted on television. But I could not find a statue or law or even mild suggestion that newspapers should not show images cigars or cigarettes. What I did find — and what a colleague told me was probably FT’s motivation — is a very strict advertising statute. There are serious penalties for newspapers that have endorsements or even remotely appear to be endorsing smoking. 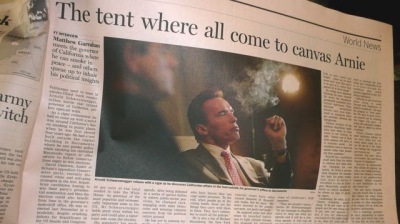 While Arnold subverted California’s strict smoking laws, the Financial Times, it appears, could not get around Singapore’s. If anyone has seen this blackout in other editions of the Financial Times, I’d love to hear about it. Three weeks ago, I moved from Los Angeles to Singapore. After three years editing an online publication about Asia, I decided it was time to be here, in Asia. I’m going to spend my time teaching writing to students at Ngee Ann Polytechnic and, hopefully, doing some writing myself. It’s a great gig, to be a writer. You get to meet interesting people, like the excellent folks of Dengue Fever, a Cambodian rock band that showed Asia Pacific Art‘s talented multimedia editor and me a great time in their studio. The diversity and location of my new home is already affording me some more terrific opportunities. Next weekend, I’ll be in Jakarta for a blogging conference. Its one of the many parts of Southeast Asia that I’m looking to explore — the virtual part, that is. It will be my first time in Indonesia, and I have a feeling I’ll be meeting a lot of interesting people. And here in Singapore — as a curious onlooker, rather than a curious writer (it’s a slim difference, admittedly) — so far I’ve seen Chinese lanterns, Malay Ramadan festivities and the Zurich ballet.